Standing cup; silver-gilt; chased; form of unicorn rampant; on chest two shields in champlevé enamel, one with half-unicorn, other with lion rampant; oval base chased with grasses and snails, and lizards and quails in full relief; inscribed. Origin: Uncertain; previously attributed to Nuremberg, late 16th century; mark of Heinrich Jonas (master 1579, died 1605). Marks: The two punch-marks are far apart, though both on the plain rim of the oval base, near the front but on either side. (i) Assay mark for Nuremberg, after 1550 (R3 3758/9). (ii) The initial K in a shield: the punch-mark of Heinrich Jonas (R3 4004). Commentary: Heinrich Jonas came from Halberstadt and was made a master in Nuremberg in 1579, where he died in 1605. In Rosenberg 1925 (R3 4004) this goldsmith's mark is recorded together with a short list of some of his works, including those preserved in the Grünes Gewölbe in Dresden and in the Moscow Kremlin. It does not mention the gourd-shaped covered cup with a sculptural stem in the Hermitage, Leningrad (J. F. Hayward, ‘Virtuoso Goldsmiths and the Triumphs of Mannerism 1540-1620’, Sotheby Parke Bernet Publications, London, 1976, p. 388, pl. 521). For a discussion of a recently discovered silver-gilt monk automaton by Heinrich Jonas and first recorded in the 1684 inventory of the ‘Hohenlohische Kunstkammer’, see WB.134. In Rosenberg 1925, the list ends with the Waddesdon unicorn and, as was noted in Read 1902, it resembles another piece by this maker (R3 4004, a) which in 1884 was in the famous collection of Dr A. Figdor in Vienna. However, neither of these publications nor the second revised edition (Dalton 1927) contained any expression of doubt about the late sixteenth-century origin of this unicorn cup in the Nuremberg workshop of Heinrich Jonas. Although surviving silver standing-cups in the form of a unicorn are extremely rare, the popularity of the subject among the Renaissance German courtly patrons seems well attested. Indeed, one example was included in the selection of silver sculpture taken to Moscow in 1603 by the delegation from the Hanseatic cities as a gift to the tsar. Another example - perhaps the finest artistic achievement in this form - is the beautiful Augsburg gilded bronze statuette of a leaping unicorn (H. 37.8 cm), which has been preserved in the Electoral Kunstkammer in Dresden and is currently attributed to the decade 1570-80 (see Gerald Heres and Werner Kiontke in ‘The Splendor of Dresden, Five Centuries of Art Collecting’, Metropolitan Museum of Art, New York, 1978, p. 86, no. 49, col. pl. on p. 35; for an earlier attribution of this unicorn figure and a bronze stag to the Augsburg workshop of Hans Reisinger, see H. Weihrauch, ‘Europäische Bronzestatuetten’, Brunswick, 1967, p. 315, fig. 385). The extremely fine chasing of the surface of this bronze is comparable to that on the silver-gilt version in the Waddesdon Bequest, but the modelling of the bronze is far more accomplished and vigorous. In particular, the curve of the animal's back and the line of its body as the hind legs take the weight and powerfully thrust the unicorn forward are brilliantly expressive of the animal's strength and movement. By contrast, Heinrich Jonas's silver figure seems poorly observed and unconvincingly executed, although it has to be remembered that, unlike the bronze, it was not made as a small-scale work of sculpture but as a Willkomm or drinking-cup in the form of the family heraldic device. It is, therefore, more appropriate to compare it with the carved narwhal horn that was mounted as a covered standing-cup in silver-gilt in the Birckenholtz workshop in Frankfurt-am-Main during the first half of the seventeenth century and was preserved in the Hesse-Darmstadt ducal collection at the Neues Palais, Darmstadt (see Schürmann and Luthmer, ‘Grossherzogliche Hessische Silberkammer’, Darmstadt, 1884, pl. 22; Marc Rosenberg, ‘Der Goldschmiede Merkzeichen’, 3rd edn, Frankfurt, vol. II, 1923, R3 2036 (a), p. 86, pl. 50). The gently domed cover is surmounted by the silver figure of a leaping unicorn - not unlike the Dresden bronze - and the stem of the cup (below the carved narwhal horn) is also in the form of a silver unicorn, with its forelegs resting on the top of a shield-like support and its hind legs resting on a naturalistically chased base. 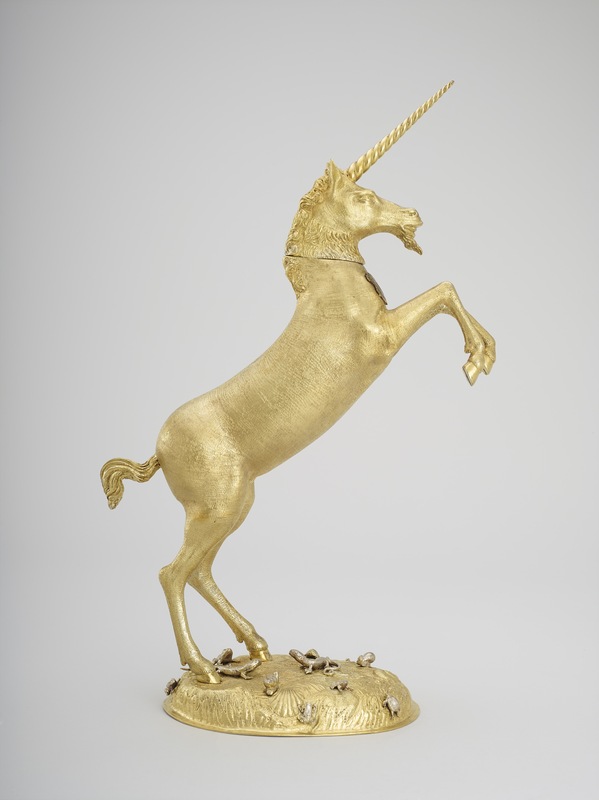 Although there are many similarities, the modelling of the body of the unicorn appears, again, to be superior to that of the Heinrich Jonas example in the Waddesdon Bequest. Among the more disturbing features of the Jonas unicorn, however, is the abrupt manner in which the longer hair around the neck ends in a straight line where the detachable head joins the body, and, even though the mane is continued, the quality of the chasing of the lower part of the mane is inferior and, consequently, does not achieve a convincingly smooth visual link-up with the head. Furthermore, another very curious feature is the application of the two small conjoined armorial shields on to the chest of the unicorn. This heraldic decoration, which seems technically to be original and not to have been added at a later stage, is without parallel among Renaissance plate of this type. Finally, the silver appliqué creatures on the silver-gilt base have a modern appearance and, although this particular style of ornament, first introduced by Wenzel Jamnitzer, was undoubtedly popular in the second half of the sixteenth century (see WB.134 for a most convincingly original example of this form of decoration by Wolf Christoff Ritter, of Nuremberg), these cast creatures do not seem to be an integrated part of the decoration but rather an afterthought. Consequently, a tentative explanation can now be advanced to account for these disturbing inconsistencies: it would seem that the head and oval base may have survived from the original unicorn cup, but that the body with its heraldic shields and the numerous silver appliqué creatures on the base have had to be replaced in modern times. The neat finish to the rim of the cup, with its crisp, small pointed dip (immediately above the conjoined shields), shows none of the corresponding signs of wear that occur on the head; furthermore, the dip does not relate to any matching protruding element on the detachable head. The sensitive modelling and fine chasing of the head and its hair are not really matched by a comparably skilful use of the technique on the body, which has an almost sausage-like lack of modelling. Although no Nuremberg silver unicorn cups can be cited for comparison, a Christoph Jamnitzer sketch of c. 1600 includes two very different images of spirited and graceful unicorns pulling a chariot (preserved in the Museum of Applied Arts, Budapest; illustrated in ‘Wenzel Jamnitzer und die Nürnberger Goldschmiedekunst 1500-1700’, exh. cat., Germanisches Nationalmuseum, Nuremberg, 1985, p. 134, fig. 107). The skill of Nuremberg goldsmiths in this lucrative market for family Willkomm cups is well attested by the extant examples such as Paulus Tullner's 1564 'lion rampant' cup of Jeremias Schweikker and Elizabeth Oelhafen (preserved in the Museum für Kunst und Gewerbe, Hamburg; illustrated in ‘Wenzel Jamnitzer’ 1985, pp. 236-7, no. 40) and the unique 'mountain goat rampant' cup of Kassel, which was made by Abraham Tittecke at the end of the sixteenth century (illustrated in ‘Wenzel Jamnitzer’ 1985, p. 260, no. 84). In the making of all these Nuremberg cups in the form of heraldic beasts the visual unity of the body and the detachable head has been a high priority with the goldsmith, and the realism of the modelling of the animal has been equally important - as can be vividly seen in the famous heraldic 'dog with dead goose' cup, the great Bobenhausen Willkomm (H. 28.5 cm) preserved in the Schatzkammer of the Deutscher Orden in Vienna. It was made by Paulus Tullner in Nuremberg c. 1570. (For Dr Bernard Demel's concise account of this historic cup and its association with the Ordensmeister Heinrich von Bobenhausen (1572-90), which also incorporates the new information contained in a doctoral thesis by Heinrich Noflatscher (Innsbruck, 1981), see ‘Wenzel Jamnitzer’ 1985, p. 237, no. 41). The Nuremberg tradition is so impressive in this particular area that no item of plate by Heinrich Jonas with the inconsistent features of this Waddesdon unicorn cup can be unquestioningly accepted as entirely original. It is, perhaps, significant that another 'unicorn rampant' cup with a similar sausage-like body - but different head - was sold at Sotheby's London auction rooms on 28 April 1937, lot 207, where it was described as “Constance, 16th century; maker's mark "HE" conjoined and another mark (Rosenberg 2922-3)”. Without the opportunity to compare the two cups side by side it is impossible to reach a conclusion, but at present it seems no longer possible to be certain that this heraldic unicorn cup is entirely the work of Heinrich Jonas, the Nuremberg goldsmith who died in 1605. Hugh Tait, 'Catalogue of the Waddesdon Bequest in the British Museum, II : The Silver Plate', British Museum, London, 1988, no. 21, figs. 139-142.